Peter Irniq: Joe Kremmidjuar, please feel welcome. Joe Kremmidjuar: I feel very welcome. Peter Irniq: It is good that I can talk with you about your residential schooling. Can you tell us, how old you were, when you first went to school in Igluligaarjuk(Chesterfield Inlet)? Can you tell us? Joe Kremmidjuar: Yes. 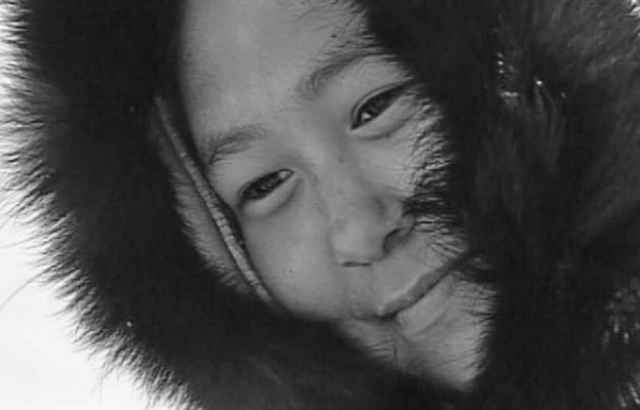 When I was seven years old, I left for Chesterfield Inlet, from Iglulik. That was in August 1957. Peter Irniq: Prior to going to school, can you talk about your life style. 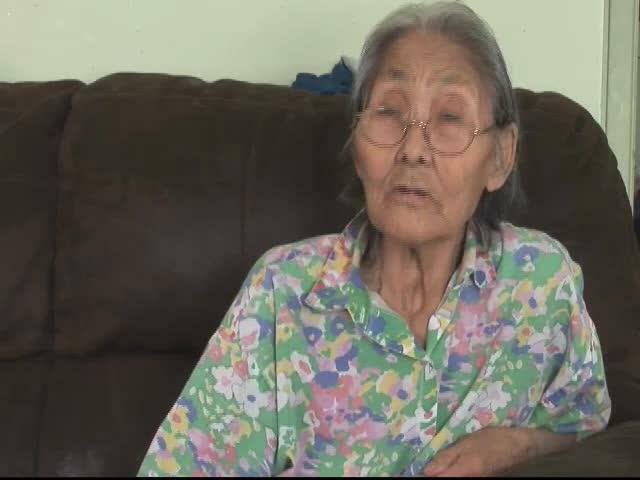 You had your parents, your sister, can you tell us about your prior Inuit being? Joe Kremmidjuar: Ones, I remember…I can tell a story about them. At that time, we did not live in Iglulik all the time. We often lived outside of Iglulik. It was wonderful, living at a outpost camp. We used to live at Akkimaniq, north of here. I was quite aware with the ability to remember. But, when I was five years old, my father passed away. I don’t remember that part but I remember very well, when I would travel by dog team. I used to have my own dogs. After my father had died, I used to be like that, living close to Iglulik, when we used to live in Qikiqtaarjuk(Small Island). That priest, apparently used to tell my mother, “that this Jusipi, will never learn, modern education, as he only wanted to travel by dog team.” That was how I was, and the priest knew all about this. However, when I turn seven years old, it was apparently my time, to go to school. 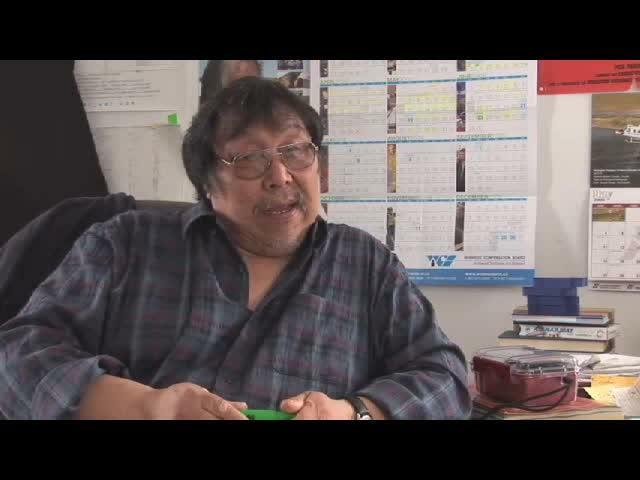 Peter Irniq: At that time, when you were living outside of Iglulik, did you lead a real Inummarik(a True Inuk) life? Joe Kremmidjuar: Yes, yes! After I no longer had a father, it seems his death made me remember everything. We would stay in a qarmaq(sod hut) and live in a tent in the summer time. 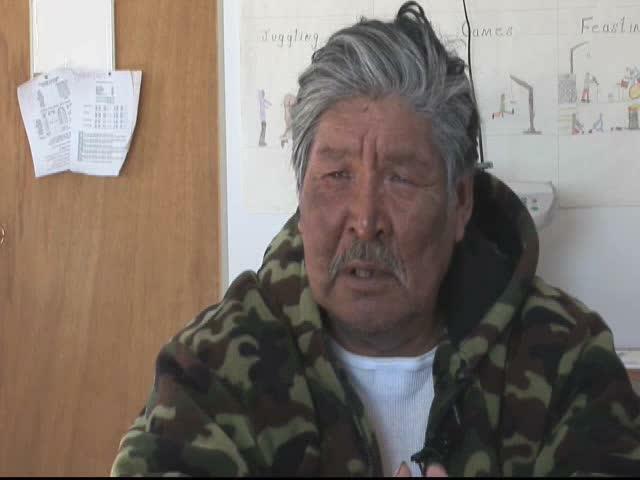 But then, when I went to Chesterfield Inlet, I would enter a Qablunaat(White People’s) houses, for the first time. Here in Iglulik, it’s original name is Ikpiarjuk(pocket/bag), but now known as Iglulik, only the Roman Catholic priests, and the staff of the Hudson’s Bay Company, they were the only ones living in (wooden) houses. There was no police. The Anglican Missionaries, known by Inuit as “Ajuriqsuijit” were not here, during early 1950’s, but only at the end of the 50’s, they came. Peter Irniq: When you lived outside of Iglulik, do you remember the names of the places, where you used to live at? 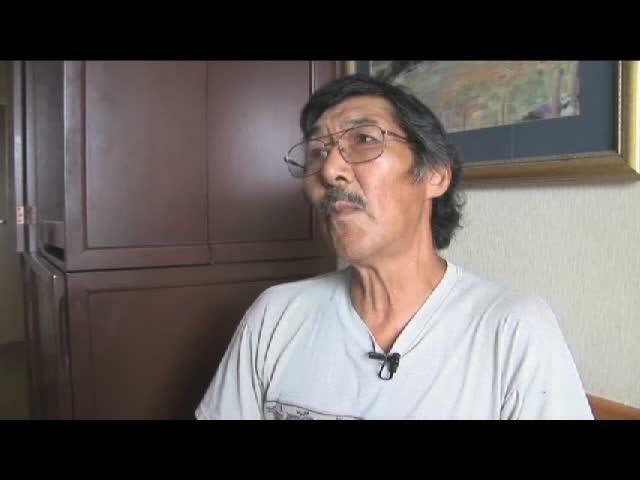 Joe Kremmidjuar: Yes, we used to live in Qikiqtaarjuk, when I no longer had a father. But, we apparently lived at Akkimaniq, north of here, while I still had a father. 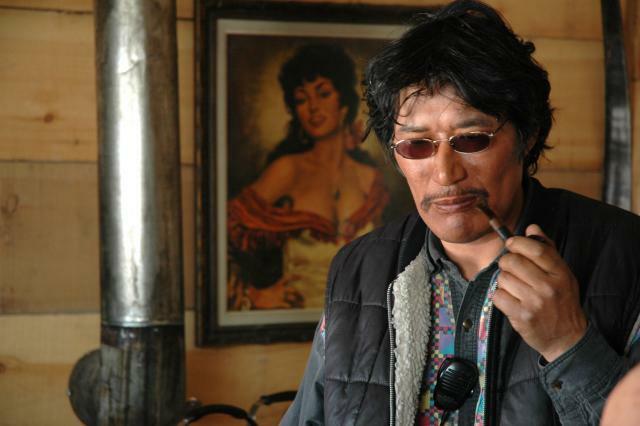 But, when my father died, we moved to Qikiqtaarjuk, yes, I remember very well. Peter Irniq: Can you talk a bit about your hunting life then, also about fishing as well? Joe Kremmidjuar: Yes, we used to go caribou hunting. We had caribou meat, walrus, fish, the complete works. We had everything, as there was no shortage any of those animals. We had seal skins. As Inuit, we had no way of knowing, anything about modern rubber boots, hip waders, shoes, let alone imagining them. Peter Irniq: The Qablunaat that were there at that time, did they dress like the Inuit as well, or the way they always did, like the White People? Joe Kremmidjuar: Yes, there was only the Hudson’s Bay Company traders, and the Roman Catholic priests, that was about all. There were no Anglican missionaries, but only in the beginning of the 1960’s, we only got RCM Police. They were really behind from the other communities. Iglulik was behind. The only Qablunaat were the Hudson’s Bay Company people and the RC Missionaries. Peter Irniq: When you went to the store, what was it like, how did it smell? Joe Kremmidjuar: It was a very pleasant smell/oder, when you would go into a store. It smell like the Qablunaat, (as oppose to Inuit smell, who lived traditionally in iglus or sod houses). The smell of a Qablunaat life, was very nice smell, it was different. Peter Irniq: Was it because of the southern supplies that were at the store? Joe Kremmidjuar: Yes, it was because of the store supplies that smelled really good, that were there for us to buy. Both the priests and Hudson’s Bay Company houses, were never locked. Whether it smelled like the White People, but the scent was definitely different from Inuit oder. Peter Irniq: What did you use to buy things? Joe Kremmidjuar: I remember noticing that we traded furs, such as fox skins and seals, perhaps there were others. When we would go to buy things, they would use sticks or metal coins, to indicate, how much money, we got. Peter Irniq: (Start from time 8:33 again) At that time, when you used to trade your furs, such as foxes or seals, do you remember when you used to buy with them? Joe Kremmidjuar: I don’t remember so much about what was bought. We the children and the young ones, never thought too much about what was bought. But, they bought tea, sugar, flour and baking powder, and other things such as bullets for rifles, and some big items such as rifles, and boats. We never used to think how much they were worth to us, and other things that were inside the store. Things that were bought, didn’t seem to have any use for us children. However, they were mainly to do with the adults. Peter Irniq: Prior to going to school in Chesterfield Inlet, was your mother told about the fact that, you were going to be going to school? Joe Kremmidjuar: Whether she was told or not, I never noticed or remembered. It was time to leave for school, that was it! We were never told about this ahead of time, that we would leave on a certain day, “be prepared to leave and plan ahead”, that was unheard of. 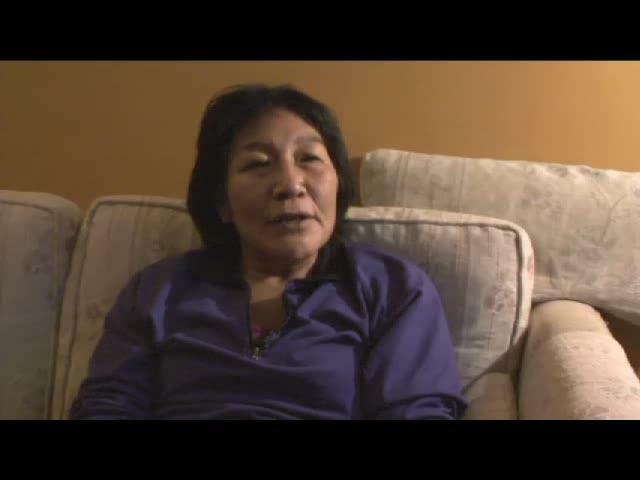 Peter Irniq: You have a sister that you went to school with to Chesterfield Inlet. Can you describe with what happened, just when you were leaving? Joe Kremmidjuaq: When the plane had arrived, there were a number of us, young boys and young girls, who were hoisted to the airplane. There were those parents, seeing their children leaving. There was no one as it seemed, concerned about their feelings, whether they thought it was okay or not okay, or agreed with us leaving them. This was not immediately known. It was like, we were snatched from our parents, just like that! Roman Catholic priests were very big bosses! If they say, you will be like that, then you are going to be like that! Then would then, have to follow their instructions. There was no way around it. Then, we were told to board the airplane by them. AS we had no airstrip in Iglulik the, the single engine airplane landed on the water, with floats. We then boarded the plane. That was it. Peter Irniq: The airplane would beach on the shore? 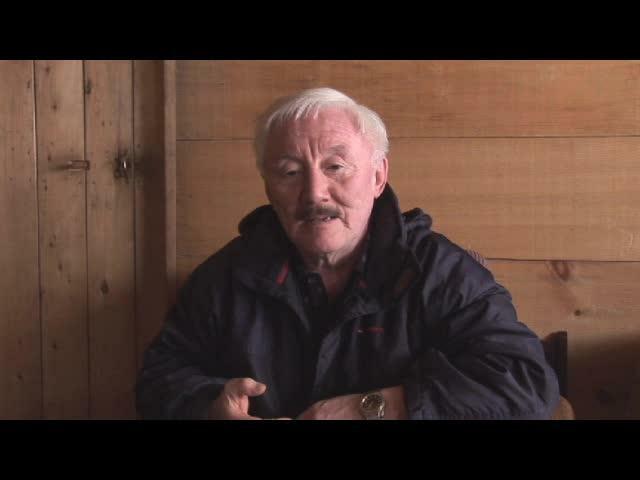 Peter Irniq: When you left Iglulik, where did you go through? 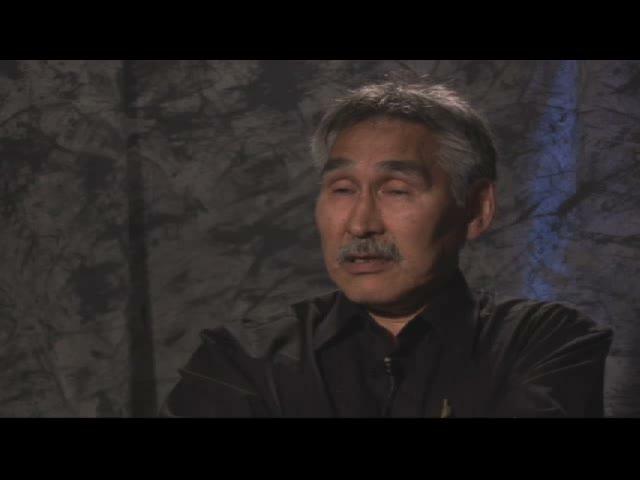 Joe Kremmidjuar: When we would leave from Iglulik, we would go direct to Naujaat-Repulse Bay. Some of those people from Naujaat, who were going to school there, would come on board to the airplane as well. Sometimes, we would overnight there. Sometimes, the airplane would land along the route, enroute to Chesterfield Inlet. Especially, when we had to land. Peter Irniq: Was it because, they thought, they were running low on gas? Peter Irniq: What would have happened you think, if your parents did not wanted you to go on board? Joe Kremmidjuar: If they did not wanted us to go, at that point, my mother had said, “once he gets bigger, once he is another year older”, no one heard her. 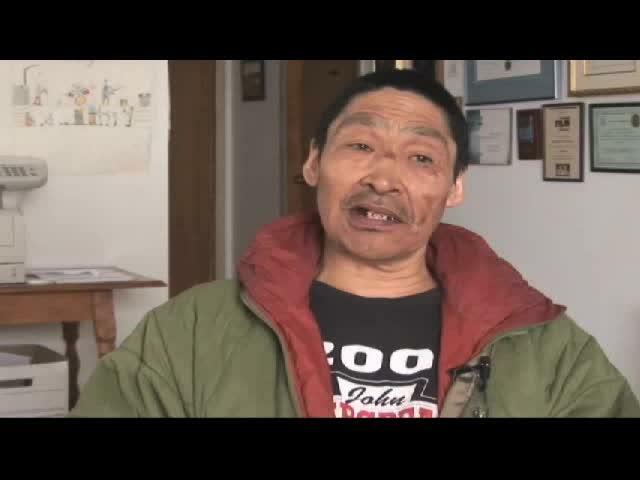 Inuit voices, Inuit concerns, didn’t have any impact on the priest, what-so-ever! Peter Irniq: Were you the youngest one at seven years old, who was sent off to school? Joe Kremmidjuar: From among our group of students who were going to school, there was some who were younger than I am, for one, my older brother’s daughter, was a bit younger than I am. Peter Irniq: What were the ages of the oldest ones? Joe Kremmidjuar: Eight, nine, around there. Peter Irniq: When you would get to Naujaat-Repulse Bay, would you stay with families or at the Roman Catholic Mission, if you had to overnight? Joe Kremmidjuar: They would put us up with the priests at the Roman Catholic Mission. Sometimes, some would be staying with families, as long as they are related. Some of those people from Naujaat, as long as they knew, some of the children were their relatives, then they would take them for night. But, some of us, would stay at the RC Mission. Peter Irniq: When you left for the first time that August, do you remember what the inside of the plane was like? Joe Kremmidjuar: Yes. That airplane was one engine, known as a Beaver. It had no seats. When we all got boarded into the plane, they just sat us down, on the floor. It was as thought, we were gathered together, like bunch of dogs. It was just like that. Peter Irniq: Did you get air sick? Joe Kremmidjuar: I didn’t notice this. I was perhaps too startled, about all what was going on. Peter Irniq: It must have been very difficult, when you left your parents for the first time. Joe Kremmidjuar: Was it hard? Yes! Was it hard to leave? All of us say, yes! As it was so very hard, the words to say it, don’t seem to have any strength! When we left, we will not be having any more conversation with them. We will not write a letter to them. At that time, we had no way of using telephones. There was none of those. We never even imagined, having them. Only the Roman Catholic priests, used them. To us, they were unthought of. We would have never been allowed to use them to communicate. It was useless to write. If I write a letter to my mother, and write about things that I did not agree with. For instance, if I say, “I am homesick”, the letter will be read by those who were looking after us, the Grey Nuns/Sisters. If they see and heard, what we did not like, they would spank/whip us, guaranteed! They would have done anything to us, punish us, what-ever-way, they consider fit! We were not to write letters like that, words, that they did not wanted to hear. When we write, they would not send them out! Writing letter was actually useless. Peter Irniq: The letters we wrote were read? 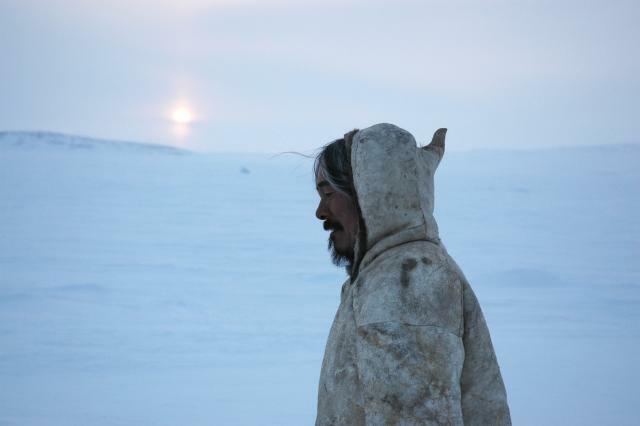 Peter Irniq: When you first arrived to Chesterfield Inlet, what was it like? Joe Kremmidjuar: It was extremely frightening! No wonder, I was seven years old. I was home sick. I wanted to go to my mother, as I had no more father, when I left. At one time, when I was playing outside, it was very beautiful to be outside. I was outside with Sabina, my sister. I started to cry and said to her: “with that canoe down in the water, please let someone take me home.” That was how much, it was hurtful. But, even, if you tried hard, it was impossible. But, that was what I wanted to do. At that point, Sabina, also became very sad. Peter Irniq: The “Big House” – the Turquetil Hall, what was it like, can you describe it? Joe Kremmidjuar: The house, where we were housed at, the “basement” was a brother, a brother, belonging to the Roman Catholic Church. Brother Parent, as he was known, he was a baker, downstairs. He baked bread. There was also engines, which were maintained, by another brother. The first floor was for the boys and the third floor was for the girls. That was how, it was done. Peter Irniq: The Turquetil Hall had a lot of rules and regulations. Can you talk about them? Joe Kremmidjuar:Yes, absolutely. The rules were awesome! The boys had a dorm here..if we were going to go outside, it was a rule that we would go outside first. This was before the girls went out. Since, this was our place, when the boys went out first, then they have to play outside in this area. The girls, who came out after us, they have to play in this opposite area. As the rule goes, we were not to be together. And the Grey Nuns, who were there as our Supervisors, were making sure, that they always watched us. They did this by walking back and forth, in between the boys and girls. They made sure that the boys and girls, didn’t sneaked and get together. If you see on TV today, people who are incarcerated in Afghanistan or any where else, they are being watched over, that’s just the way, we were watched. That was how, we were treated. Peter Irniq: You were not free to do what you wanted to do? Joe Kremmidjuar: We were not at all free to do what we wanted to do! And when we went outside, we just didn’t get ready and go out. They marched us by two’s, side by side when we went out, just like they do with military style. And as children, we were not allowed to do silly things, that was how, they treated us, just like, they would have us walk in two’s, when we were being sent to a church. Same thing, when they sent us off to school. Peter Irniq: Were you able to talk to the girls? Joe Kremmidjuar: Only sometimes, we could, perhaps at school. And only in English. I was forbidden to speak to my sister. As the rule goes, only time, I was able to talk to her was on Sundays. And it was from 4 p.m. to 5 p.m., for one hour. We would go to our dining room. If it was this table, I would sit here and my sister, would sit across from me. Then, we would be able to talk. But then again, our Supervisors, the Grey Nuns, would keep their eyes on us, all the time. They would keep listening and hear about what we had to say, all the time. That was how, we were treated. Peter Irniq: Some of the punishment were very serious. Can you talk about different types of punishments? Joe Kremmidjuar: The language itself doesn’t appear to be scary. But, being physically hurt. To get hurt on the body, it seemed, it was nothing and maybe even thankful. But, when you were hurt inside you, that was extremely offending! We had one huge dormitory, with many beds, next to each other. On the other side there, there was a playroom, where, we used to get together in the evenings. Sometimes, some of us would go to sleep without any pajamas at all. As long as the Sisters did not agree with this, they would let us sleep on the floor. Peter Irniq: And yet, you had a bed. Joe Kremmidjuar: Here, we had a bed. 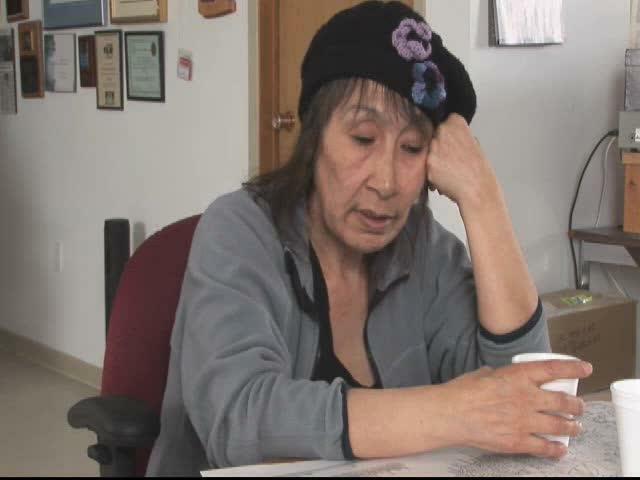 Ones, that used to say it was very hard..ones that went to Iqaluit and Churchill..no..when I went to Churchill to attend Churchill Vocational Center, it was as though, I was on holidays. That was exactly how I thought. They were free to do anything. They smoked cigarettes, and speaking with girls. They were free to wear any type of clothing, they wanted to. When I went to Churchill, it was such an easy life. 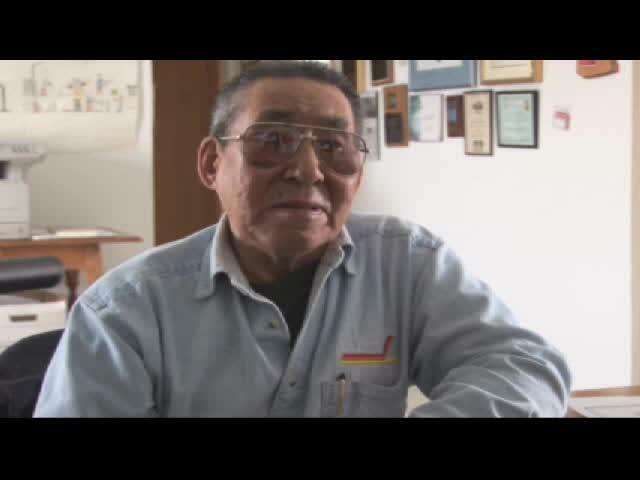 Peter Irniq: In Chesterfield Inlet, some students were very young, youngest one perhaps being six years old, I don’t know..when they were sending us off to sleep there, they would put the lights out. Do you remember hearing the little ones crying, being homesick for home? Joe Kremmidjuar: Yes, I could hear them crying. Sometimes, they would cry quietly, so no one would hear them. They would cry for their mothers and fathers. When they started doing that, then you would start following them, even though, you were resisting to do it. Peter Irniq: Were the Supervisors, the Grey Nuns, hear when they were crying? Joe Kremmidjuar: Yes, they heard them but the thing was, they would hurt them. They would tell them not to cry. They would punish them on the spot! These people, wanted to run everything. They wanted to control everything, our physical bodies, our emotions and our minds. Including our thoughts inside our brain. The Sisters wanted to control all of them, and they did. Peter Irniq: They were not comforted, when they were crying? Joe Kremmidjuar Yes. And yet, these Sisters are Christians. They would have never comforted anyone. They would punish and physically hurt the children. They would whip them and hit them with yard sticks. Peter Irniq: Did you believe that they did not have love or compassion? Joe Kremmidjuar: They were confusing. The only thing, they taught us was about believing or Christianity. They taught us mostly about Jesus. We prayed and prayed since getting there. But the way, they did things, were very unchristian. They were only intimidating people. As a result, we expected bad things to happen. We never expected to get positive things. But, when the month of May comes around, we started to hear really nice things. Why was this? We were soon to be going home. It was only during this period, that they became very nice. And yet, they still worked to fix our brains. “Look, you were treated very well here.” On during this period, then they started to do good things, knowing full well, that we would be going home soon. It looked as though, what ever happened to us between August and May, was completely erased! Peter Irniq: What was it like when you first entered a classroom. Do you remember? Joe Kremmidjuar: Things that were drilled into our minds, they are never to be forgotten. No wonder, we saw these different kinds of houses..it was very awesome! Including the one that we were going to use as our school. When we got into the school, we had different sets of groups, from the lowest ones, to the ones that can do it best(Higher Grades). That was how, we were set up. We also got to know, who our teachers going to be. They were identified for us. At that time, in the school, Sisters were not the only teachers. There were ordinary Qablunaat(White People) teachers, women. Peter Irniq: It is well known that we were not allowed to speak our Inuktitut language. Can you talk about that? Joe Kremmidjuar: To speak Inuktitut, it was truly a scary one. To do so, you would have been hit with a chalk, hit with a yard stick, as well as erasers. They were truly hurting you, in a very big way. They would pull your hair. You were kicked, hit with a fist, that was how, we were treated. 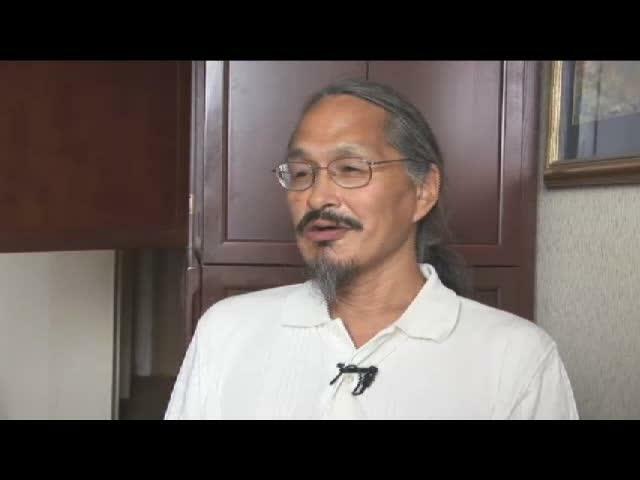 Peter Irniq: Since we were not allowed to speak our Inuktitut language, do you remember well, what happened to you, if you were caught speaking Inuktitut? What would have happened to you? Joe Kremmidjuar: Yes. Of course. They would pull us by the ear, or pull us by our hair. Then, they would put us in the corner of the classroom. We were then scolded very loudly, and told, “you are stupid, you are useless!” It’s unbelievable about how, we were treated. Scary! Peter Irniq: Do you remember one of our teachers, used to take a young boy or a girl by the front, and threw them against them? Do you remember something like that? Joe Kremmidjuar: Yes, I used to see it. Yes, it hurts to see young boys being thrown like that, it was even more hurtful, to see young girls being thrown around like that. Sometimes, a teacher would throw a chalk at a very close range and obviously, the student would be very hurt physically. They tried not to cry. At that time, during the school period, someone who was the same height as me, but a bit older, he was regularly made to be scared and intimidated like that, that person is still not talk much about that to this day. It is because, he was intimidated too much at that time. Today, some people make fun of him because, he is not able to talk much. But, this person doesn’t know that he was abused too much, mentally, inside his head. Peter Irniq: Could you not talk back to the teachers then? Joe Kremmidjuar: To talk back, it would have been a big mistake, it was very scary. Peter Irniq: Do you think, we would have been sent home, if we did talk back? Or, would we have been scolded severely? Joe Kremmidjuar: We would not have been sent home. They would have made sure, things would have been harder for us. This was to make sure the others were taught a lesson, that you are not supposed to do this! Peter Irniq: Today, these times, the way we were abused, is talked about, quite a lot, by many survivors. People talk about having been sexually abused, when we were little children. Can you talk about this, about what you know? To bring this out from inside of you, from your heart, it feels like you are being torn apart, inside. It seems like, a wound that you have, an ancient wound, is finally being, opened up. To start talking about it at first, you feel, no one is going to believe me. People are just going to laugh and make fun of me. Like, it is scary! To use the kind of life like that, to think, you are different from others, and on the other hand, to be kicked, and be hit with a ruler, it almost seems like, you are saying, that you are almost thankful. Peter Irniq: Those who did these things, the priests, the sisters, the Qablunaat, did you know who they were? Joe Kremmidjuar: I cannot name them all. There are some I can identify. Christian Brother and a Sister. Those are the two, I can identify. Peter Irniq: When they were going to do this, what did they do? Joe Kremmidjuar: “You don’t have to tell anyone, about this.” “If you tell anyone, you will go to Hell.” They used the Christianity beliefs as intimidation. These Brothers, when they were about to propose, their breath and voice, used to be very nervous, from way, way inside. They would speak or even just breathing, they would be very nervous. To hear their breath, it was very nervous. It was very obvious that they were not their usual normal self. It was very scary, for me. Perhaps, to all of us. It was like, all my insights, my guts, intestines, became very cold. It was because, I was too scared! To be touched by a fellow-man, how would you, yourself describe it, how can to tell about it? It is difficult to tell about it. But, because, the feel of it, very different. There is nothing like it. To those, who do not know anything about it, they think it’s funny. They do that to their fellow-men, they tease them, they don’t understand the abuse. Perhaps because, they are hiding something as well. It is a very different to be abused like that. Peter Irniq: Did you tell your fellow-students then, about these things? Joe Kremmidjuar: Absolutely not! It was not possible to talk about this, especially being abused by a fellow-man. At least, when I was at home in Iglulik, you just didn’t think about these things, at all, especially among my relatives and friends, prior to going to school. No one ever thought about men doing these to each other, that is. Only when I became associated with the Qablunaat(White People) by going to school, this became visible. It was hard enough to start learning about Qablunaaq ways, but then, it was even harder when these things to do with men to men, women to women, were being practiced. So, these Roman Catholic missionaries, did they get us Inuit together, to teach us about these things? Did they wanted us to learn about these things? Were they planning for us to get angry? Is that the reason why, they are priests? Is this the reason why, they are Sisters? They then teach us about all these things, and why the heck do they call themselves Christians and believers? This issue truly makes you angry! Peter Irniq: Did you detoured a way of life? Joe Kremmidjuar: Not only did they detoured a way of life. They not only directed these things at one person. But our children and our grandchildren, are now involved. Looking at my own situation, I was a big time, drunk with liquor! That was like trying to hide all this shame. As it is totally something, different. When I was drinking, I became very angry, then I was hurting someone else. I would become a very scary person! This was all to do with hiding something. I didn’t wanted to use it. It was very embarrassing to use it, personally. And yet, I called myself a man. I was no longer considered a man, I became just someone who was hurting some one else. I became just someone who was intimidating some one else. Peter Irniq: At that time, if we would have had someone to tell, I wonder if we would have been believed, if we had complained? Joe Kremmidjuar: I don’t think so! Peter Irniq: At that time, if we could have complained, was there was no one to complain to? Joe Kremmidjuar: This type of activity is was not part of Inuit culture, even probably to this day. Inuit are not like that. Perhaps, it is coming out, in some areas. And yet, these are the priests, these are the sisters, and these are the Christians! They pray every day and hear sinners all the time. They have Jesus! Peter Irniq: In 1993, we had a Reunion of the Turquetil Hall/Sir Joseph Bernier Federal Day School, survivors. We wanted to start our healing journey. So we met in July. Can you talk about the healing journey, we were undertaking at that time? Joe Kremmidjuar: The thought at that time was, how will I be looked at, what and how will I be thought of, how will it help me, personally. How will it change my life? Who will understand me? Will I just say something that is embarrassing to others? Will my fellow-Inuit hate me? But the thing is, when you are not alone, you have a wife, children and grandchildren, you truly want to fix it. You want to show them love, strength. Well, if you have to fall down yourself for a while, then you can let it out, and begin a healing journey. That is the way to move forward. If we only want people to like us, and as long as we keep hiding what we have, we are not going to move forward and heal. No only us, but all of us! It doesn’t matter where you were educated, it doesn’t matter where you live, it doesn’t matter at all. It doesn’t matter about all this embarrassment. Once, you get it all out, then you can breathe freely, for the first time, in your life. That was my situation. Wow, I can breathe much easier now. I can now make all this public, it’s because, I love my wife, my children and my grandchildren. We are like this, we tell our wives, or our husbands, our children and tell them we love them. At the same time, when we are using alcohol, drugs and beating up our spouses, as long as we are using those, I don’t think, we are truly promoting love and compassion. If we truly love our relatives, then let us stand up and try to be strong. If we want to truly show that we can do it, then let us use all these good things, and then stand up. It’s okay, to let yourself fall for a while, as long as you can go back up again, let it all out! Peter Irniq: During the time we met, there were about 150 of us, who met, we were really looking for help from people. Did you get any help from your fellow-Inuit? Joe Kremmidjuar: I wish, I could say yes, but I have to say no! We were not helped. The only thing we were told was that, those that were in Chesterfield Inlet, all they are, is that they are different. They are like this. We had people, who did not wanted to attend, in case, they were going to be made to be bad people, by the public. There were those, who tried hard to help all of us. We have to recognize them. I commend them for doing so! Those who are the leaders of today, only when the issue of compensation came up for survivors of residential school, then they decided to finally came to “help. When it became extremely hard for us survivors – it was like when the seal had “climbed up to the ice.” It was like we were in the water. When we were trying to “climb on to the ice” the leaders of the day, never came near us! If they came to help me, I would have been too different from others to help out. If I would have told them, “I’ll give you some money,” then, they would have come to help me. Yes, we had people like that. And today, they want to be elected! Yes, I am thankful that this help is now appearing, coming along. And yes, thank you very, very much. This issue was started, even though, it was very hard to do. There were people, who worked very hard to begin this work. It would have been much more thankful, if our today’s leaders would have come along to help us too. If they could have agreed with us. This stuff was too horrible for their liking and even to come and help us out! That is no leadership to me! How regretful! How unfortunate! Peter Irniq: What would you say to Canadians today, about our experiences at the residential school? Especially about, how we were abused? Peter Irniq: What would you want them to know? Joe Kremmidjuar: To help us out? Peter Irniq: Yes.”This is the way we were treated. What would you like Canadian to know? What would you tell them? Do you understand? Joe Kremmidjuar: I don’t understand. Peter Irniq: What would you like to tell our fellow-Canadians, what would you like to tell them today? Joe Kremmidjuar: The issue has to be fully understood – the issue that we are trying to talk about. It is being heard all over. Now the Canadian Government is making the issue appear more on the table. This is what is going to be talked about. The issue that is being talked about by the Canadian Government, is very good to hear. The terrible issue which was placed un to the Aboriginal People is now talked about in terms of how to proceed with it. The Canadian have not completely reached to the end. So the ones that are going to run this organization are all Indians. The First Nations and Inuit are not the same from each other. We are also Aboriginal People but when identify us as Inuit, we are considered differently. And it is true. Ones who live in the south, are Aboriginal People. Inuit are different. We are not Aboriginals! For example, at the time when the Healing Foundation was established, there was $25 million for healing. Much bigger chuck of that money was used for those in the south, the Indians. Now, the healing journey is s tarting to happen about the Truth and Reconciliation Commission, again, there are no Inuit from Inuit homelands! How are we being looked at? We were the ones to push all this to start. But then, we are just on sidelines! Yes, it is good that this is being started but let’s have more Inuit voices! We have to have a voice3! They are still, just the way they were, long time ago, making Inuit as just “yes” people. We are not going to just say yes, any more, to whatever. 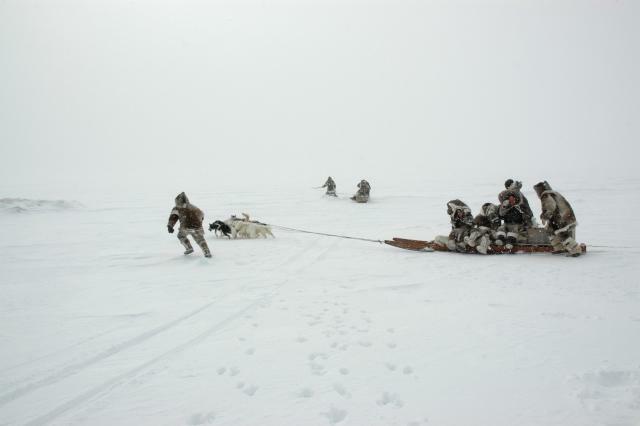 This is the type of experience, they have gotten used to, from their past experiences with the Inuit. Whatever we were told to do, we just said, “yes, yes.” Inuit were taught never to talk back to the Whiteman. We are not like that today. Inuit were broken too, we need to have our own truth and reconciliation organization, one that will heal us. We need to say something, by voicing our own opinions. Peter Irniq: What we learned in school at that time about learning to speak English and write English. What can you say about that? Joe Kremmidjuar: Yes, I have always been thankful for what we were educated about. It is extremely useful. It has a huge help today, for me, personally. We were very well educated! Learning English, writing English, adding arithmetic, yes, it is not only a wonderful experience but I am very thankful, for sure. They are useful for me today help those, who have never been to school. Peter Irniq: What we expereicned at that time in terms of modern education, is it better than what we have today, does it seem that way? I don’t know. Joe Kremmidjuar: Part of it yes, from what I have seen. At that time, the education system for example, came from England. About the English language, how to write it properly, and do arithmetic properly, we were taught very well about those things. Today’s education is very different – they are talking and learning any old way now. To see the homework of my children and my grandchildren, I ask them what they learned that day? This is what we did today. They just seem to do things just any old way. When we started schooling at that time, we were around six or seven years old. We learn to do things very well, like adding arithmetic. Today, they just use computers. Yes, it’s nice to work with those but that is what you use today to work with, in the workplace. But what we learn at that time has a huge useage! Peter Irniq: What did we learn? Joe Kremmidjuar: Arithmetic, learning about the earth, the world, social studies, science, maps and how to do things, language issues, even about believing in religion. But, I do not hold on to believing. I don’t know why, but all the others we learned have a lot of impact on me. 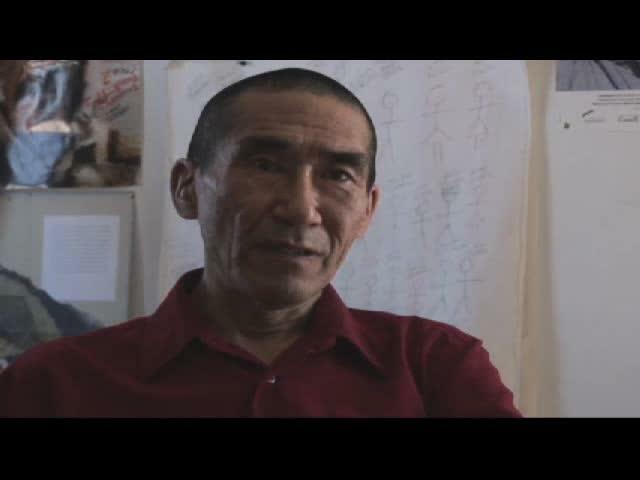 Peter Irniq: Did you learn about Inuktitut in the classroom? Joe Kremmidjuar: No. No. We had to learn the ways of the White people. We were only being taught about their ways. While I was still growing up and those of us, who grew up around outpost camps in the Kivalliq Region, Qitirmiut and Baffin Island, all were eventually gathered together by the White People and their ways, to be like them. At that point, they no longer traveled by dog team, now some had jobs, I don’t think, they did not wanted you to go all the way either in educating you. White People have always said, “Inuit are very simplistic people and very easy going people.” “Their minds are easy to get at.” That is what they have always said. They wanted you to learn small things like being a cook, seamstress, becoming a Christian Brother, they wanted to teach us about small things. They thought, Inuit were just drinking alcohol, they are just abusers, now they are labelling us with those, even thought they got us started us on all these things. But, they wanted us to be assimilated into their being. When Inuit started to use their culture, then, they didn’t agree with it. Peter Irniq: Why, were we sent to Chesterfield Inlet, to do what? Joe Kremmidjuar: I don’t know. Only the Roman Catholic believers were sent to that school. Anglican believers and others were not sent there. I don’t know how they wanted end result to be fixed. Peter Irniq: Perhaps, they wanted to become White People? Joe Kremmidjuar: Perhaps, yes. Perhaps they wanted to control more Inuit. I think, they thought we were always going to be unable to do things ourselves. One time I was very angry and said to one priest, while they were having a meeting. This priest was one of the members of this committee. I went to their meeting. When I spoke, I said things, quite on purposely. I spoke English. Then the priest started to scold me. “You are an Inuk, you have to speak Inuktitut!” he said. As for me, I got angry and was no longer intidimated by any one. I said to the priest. “Hey priest, when my mother did not wanted me to go to school because I was too small, and you send me away. I have now learn the White People’s ways. What you have taught me, I have become and am using it. I am not going to stop any more!” After that, he did not answer back. Perhaps, he learned his lesson about these people, who can now answer back to him! 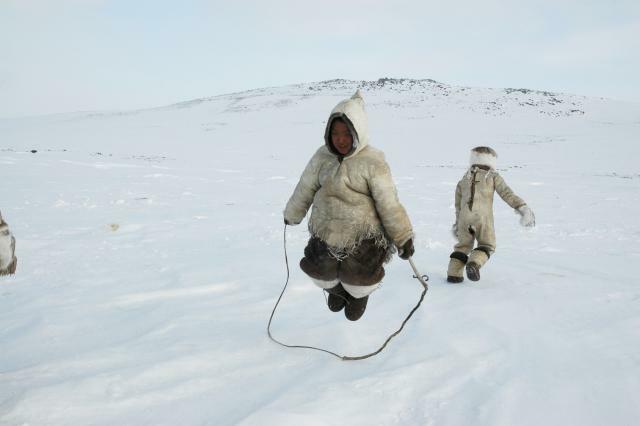 Inuit are no longer intimidated. Peter Irniq: Do you remember what you ate at the Turquetil Hall Residence? Joe Kremmidjuar: Yes! We ate beans! What I ate was Arctic Char at home, before I went to that school. I ate Inuit foods, before I went to school, such as seal meat, you know animals. When we got to that hostel, we ate at times fish, that was very old, at times, it was even rancid or congealed oil greased fish! And Arctic Char heads, I always thought, they were for adults to eat, I was growing up. We ate Arctic Char heads for supper, and had tea. Peter Irniq: Do you remember these fish still had guts? Joe Kremmidjuar: Yes! I remember noticing that! Well, at least if they were fresh fish! But, they were very old, aaahhh, they were really bad tasting! When we were eating, Sisters would be walking around our table, holding a yard stick on their hands. They would yell at us, “finish it!” Then, they would hit the top of the table with a yard stick!! This was to make sure, that we finished eating our meal. 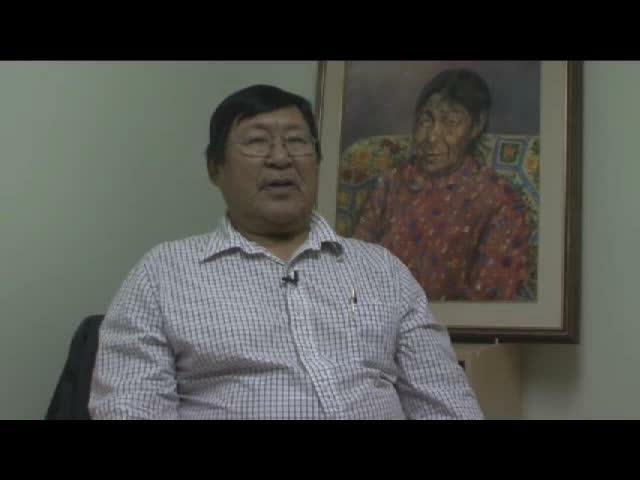 Peter Irniq: When we had a Reunion of the Residential School Survivors in 1993 in Chesterfield Inlet. Bishop of the Roman Catholic Diosese for the Hudson Bay, delivered an apology, did you agree with his apology? Joe Kremmidjuar: No! I don’t know how to say it but I totally disagreed with it. He never said, he was sorry! All he said was, he wanted to get this whole thing over with! He never completed what he had to say. With it, all he wanted to do was to shut us up! He was apparently very strong to the Roman Catholic, especially to the ones, he represented. He had a great authority within his church, after all, he was their Leader, in the Hudson Bay Diocese. To us, all he wanted to say was and only in part, and to shut us up. He said yes to part of it and said no to the other part of his apology. At that time, it was not good apology. Peter Irniq: On February 27, 1996, Bishop delivered another apology in Iglulik. Were you there? Joe Kremmidjuar: I think, I was there, yes. Peter Irniq: That other apology, what did you think of it? Joe Kremmidjuar: I did not notice it much, whether he said something really new or big. Peter Irniq: At that time, you already said this but, when we were going to be going home in the spring time, the Sisters used to get really nice, do you remember what sisters, the priests and the teachers used to say? Joe Kremmidjuar: What they used to do was to give us candies and gums, often. And we were not going to keep those either, they would be snatched from us, by one of our fellow-Inuit at the hall(because he was a big bully). The supervisors would send us to the church, a bit more often, than previously. They would let us pray for good weather so that we would leave for home, in time. And perhaps, we were doing some of the prayings for ourselves too, as we were always very homesick. They would all become extra-nice, nice to us. They try in every way possible for us to think about nice things – “you were treated really well in the past year, be sure to come back in the fall time.” That was what they used to say to us. Peter Irniq: You said earlier as a Roman Catholic, you prayed a lot. How do you look at the Church and your too much prayings at that time, today? Joe Kremmidjuar: I came to the point where I did not at all wanted to use it any more. I was looking ways whereby I was king “what does this believing mean?” They taught us, believing means, believing in God and Jesus, and yet, they preached to us bad things. They taught about scary and intimidating things. It seems like, I did not at all want to be part of it any more. Really, I have been kicked out of the Roman Catholic Church, anyways. I was kicked out after I divorced my wife. That what the priest did and I don’t mind it. I was as usual not good! When this took place, I then switched to Anglicans. Well, at one point, I really thought of no longer believing in the Roman Catholic or Anglican Church. And only wanted to believe in non-denominational organization, to something even higher, I don’t know to who but perhaps to God. I did not wanted to use RC or Glad Tidings, or Penticostals, all those and not use any of the names. I only wanted to believe only to “the one”, that was how I was thinking. Peter Irniq: When you got back to Iglulik from Chesterfield Inlet, when you set food on your own land, how was it? Joe Kremmidjuar: Wow! It was unbelievable! Maybe, it was such happiness inside me that it made me anxious, not calm or peaceful, crying! It was because we were brainwashed to the maximum in Chestesterfield Inlet. After we have been at home for three weeks or a month, as soon as my mother would touched me to wake me up, I’d be up immediately or on the spot. This was something I’ve gotten very used to in Chesterfield Inlet. My mind was totally brainwashed a lot continually, so I just got used to it at home. Some time after, maybe in a month or so, I’d be normal again, only to go back in August, for the same things, August to May. When I get there, I will then again be made to repeat, all that stuff. Peter Irniq: You were mentioning that you no longer wanted to use alcohol and have gone beyond all this, and reached your own destination. What kind of strength and vision have you been given and who gave it to you, so that you can see ahead far away? 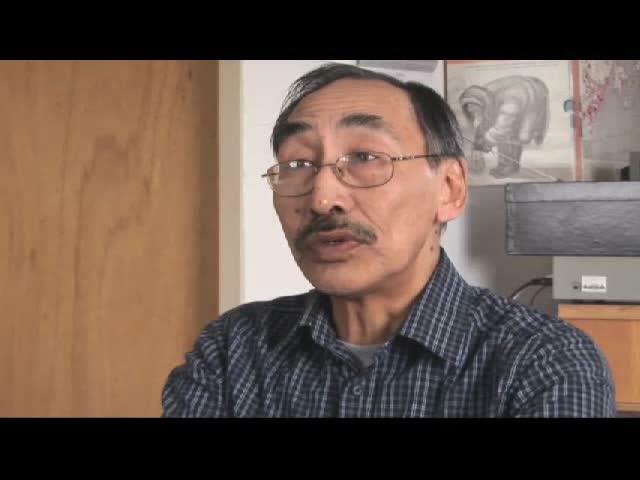 Joe Kremmidjuar: I have looked at my Inuit being/life. Looking at myself, I have received help. My wife, my children, my grandchildren, if I truly love them, then I would have to fix my life. This is o that I will net be able to destroy some one else’s life. Having done or gone through all this in my life time, it’s like, I have tears inside me. I have thought of both unhappiness and happiness. I have had the most wonderful help, like from my wife. If it were not for her, I would have just felt sorry for myself, that I am like this and that, that I have been mae to feel hurt, and I cannot fix myself for the better. I am very thankful, she is standing with me. Thank you! She has allowed herself to stand next to me. When I reached ouit to her with my hand, she has held my hand. This includes my children, and my grandchildren. I will continue to go through sometimes what seems impossible, but I want to move forward for ever! Life is scary, as long as you do not try to use it properly with respect. And thankfulness is always very awesome, as it get out, the way you feel. It is not eough to say, thank you. There are people out there who want to help. But when you go through hard times, difficult times, rough times, scary times, my wife has been beside me on my immediate side, not leave all alone, Wow! Peter Irniq: Thank you so very much! You are also such a strong person! 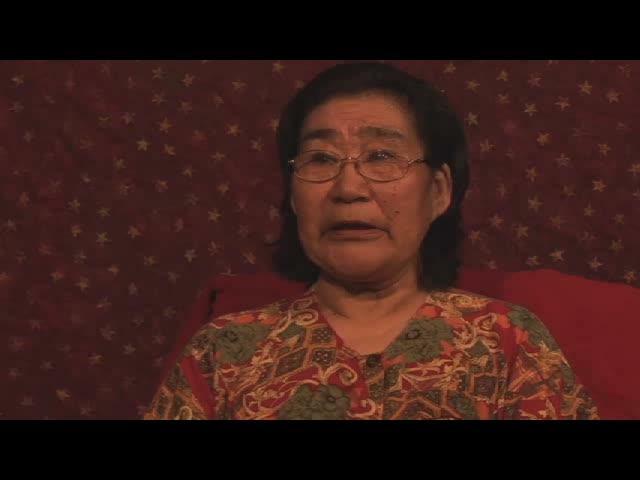 You have such strong voice!